Pretty much every city thinks its traffic is the worst -- Atlanta, LA, and Houston moan about theirs plenty. But those cities aren't the only ones clogged with smog, road rage, and drivers considering peeing into empty soda bottles before they hit the next exit. In fact, none of them is the worst in the world. The king of awful traffic? Jakarta, Indonesia. 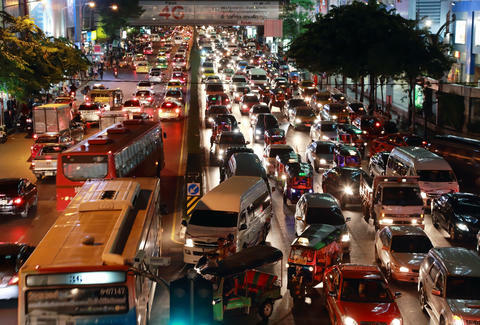 According to Castrol's Magnatec Stop-Start index (clunkily named after a gas product, of course), Jakarta's caught in the most traffic jams on Earth, with approximately 33,240 stop-starts per year. The index pulled data from TomTom navigation users to calculate the number of stops and starts made per kilometer, multiplying that figure by the average distance driven every year in 78 countries. Drivers in Istanbul, Turkey encounter the second worst congestion, with at least 32,520 jams. And Mexico City, Mexico, comes in third, with 30,840 jams a year. As for the fastest-moving cities, Tampere, Finland takes the lead with just 6,240 stop-starts, while Rotterdam, Netherlands, where everyone rides bicycles anyway, gets jammed up a mere 6,360 times a year. Bratislava, Slovakia, and Abu Dhabi, UAE, are tied in third place with 6,840 jams apiece. In the US, traffic's predictably awful in Los Angeles and New York (of course it is), the only two American cities to make the list! Though it might surprise you to learn that NYC -- where there are approx. 16,320 stop-starts a year -- is almost twice as congested as LA, which has a paltry 9,360 stop-starts in comparison.